Engaging North Korea diplomatically is the only responsible option, the only one able to work, the only sound policy Trump administration officials reject. Washington bears full responsibility for heightened tensions on the Korean peninsula, not Pyongyang. 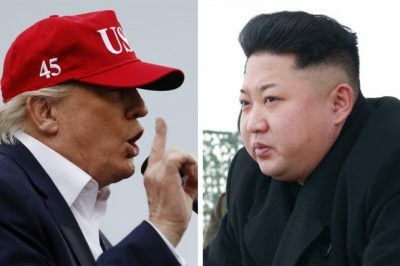 With or without Security Council authorization, perhaps Trump intends ordering interdictions and inspections of North Korean ships in international waters – something Pyongyang won’t tolerate, a policy, if ordered, risking war. Other options Trump is weighing include stiffer unilateral sanctions including against Chinese banks doing business with North Korea, deploying additional THAAD missile systems Russia and China strongly object to, installing land-based Aegis SM-3 missile interceptors, deploying tactical nuclear weapons to South Korea ending decades of US peninsula denuclearization policy, or possible preemptive military strikes. “I would prefer not going the route of the military, but it’s something certainly that could happen,” Trump said days earlier. Separately, British officials suggested Iran helped North Korea develop its nuclear capability, an unacceptable provocative claim. Claiming Russia may have helped Pyongyang develop its nuclear weapons capability is absurd and insulting. Iran doesn’t have this capability. Its nuclear program has no military component. It strongly urges a nuclear-free Middle East. Israel is the only regional armed and dangerous nuclear power. “(O)ther have started through an escalation caused by sleepwalking…We have to hope that the seriousness of this threat puts us on the path of reason before it is too late,” adding Pyongyang must halt its nuclear and ballistic missile tests. Like his predecessors, Guterres represents Western interests. Instead of explaining why Pyongyang needs this deterrent, he was silent about its genuine fear of US aggression. The way to suspend its nuclear and ballistic missile programs is by ending the threat it faces – something Washington rejects, heightening tensions further instead of easing them responsibly.